The Aral Sea ship graveyard near Zhalanash used to host a dozen beached fishing trawlers. They had fled from the port of Aralsk as the sea dried up, but then, with nowhere else to flee, had been abandoned at Zhalanash. Most of the ships have long since been broken up and taken for scrap, but there are still the partial remains of one larger ship and two small ones. All the hulls and most of the deck have been removed, but the decayed superstructures are largely intact. The larger ship in particular is quite striking and I clambered cautiously up to the rotten higher deck and the bridge. Although the ships are just skeletons they are great fun to see; suitably eerie and alien on the dry salty sea bed, which is covered with sand, grass and small sea shells. 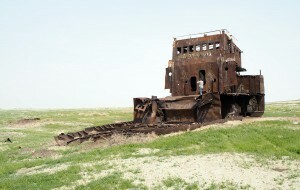 This is in Kazakhstan, at the Northern end of the Aral Sea. The Southern end of the sea is dying, but while the Northern section of the sea is still much lower than in the past, its level has been stabilized and has even partially recovered due to the Kok-Aral Dam, which keeps the Northern water boxed in to a small manageable area. Freshwater fish have now returned and displaced the saltwater flounders, and there is even hope that sturgeon may return. 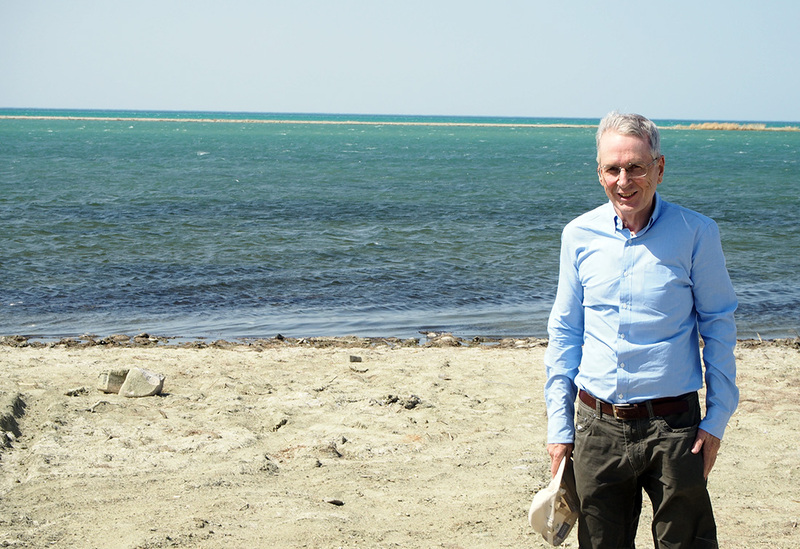 After visiting the sea itself, we stopped at the nearby village of Tastubek, which lives by fishing and livestock farming. 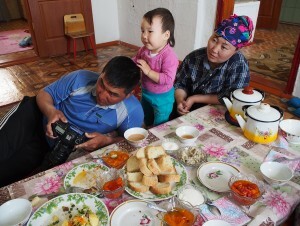 My guide, Serik from Aral Tenizi, had arranged lunch with a Kazakh family. This was fun. The young wife had prepared a fine meal, with a tasty dish of horsemeat and potatoes; good bread; apricots in syrup; and much else. I enjoyed a cup of shumat, fermented camel milk, which tastes like a very sour and slightly bitter yoghurt. Half way through, the husband returned and struck up a conversation in mixed Turkish/Kazakh with a Turkish visitor. 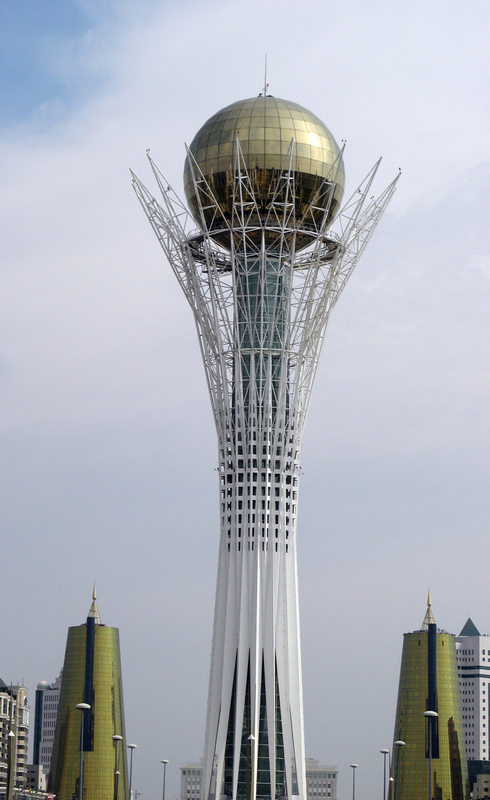 I was amused when a Turkish suggestion of “… Instagram?” was rebuked with a vigorous Kazakh assertion of “ … Whatsapp!”. 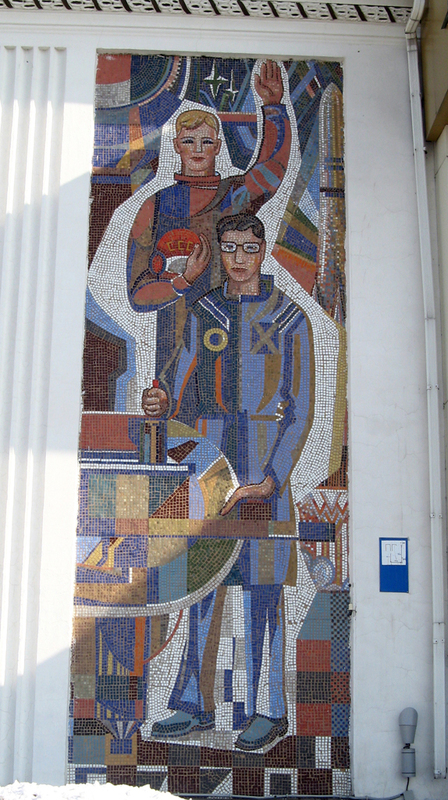 The next day we drove to visit the Kok-Aral Dam. Visually this is very tame, merely a low ridge on a concrete core. We stopped at a large set of sluice gates, currently open, which allow excess water to drain South. By allowing fresh water to enter the Northern sea from the Syr Darya (Jaxartes) River while sending overflows of mixed semi-salty water to exit South, the wise Kazakhs are also freshening the Northern section. Unfortunately none of the exiting water makes it to Uzbekistan or the Southern section of the sea. It all dries up within 70km at most. 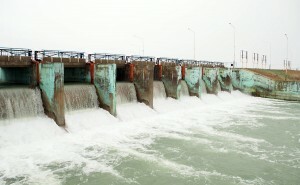 There is a plan to raise the height of the dam, thus expanding the stabilized Northern area, with work planned to start next year. So the Aral Sea may yet return to Zhalanash and its beached ships, and to the currently high-and-dry fishing port of Aralsk! I found myself in a tour group of six: our guide told us we were all the tourists visiting the launch. There were also some press, and various Roscosmos/ESA/NASA guests, but it looked like there were still well under 200 observers in total. So it was a much more intimate event than a shuttle launch at Kennedy. Before the launch we got to see lots of cool toys from the Soviet space program, including a lot of the machinery for the Energia/Buran shuttle. 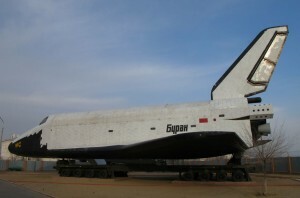 This included sitting in the pilot seats of a full-scale Buran mock-up, clambering over a giant Buran transporter vehicle and then waking around a launch pad. The transporter and launch pad felt like relics from some alien civilization: enormous, exotic, and standing mysteriously abandoned. 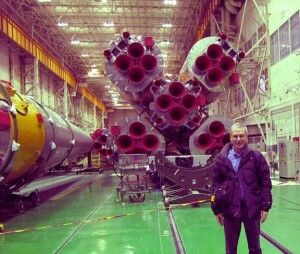 They let our little group into the Soyuz assembly building, so we got to see some Soyuz boosters and then a complete Soyuz launch vehicle up close. A lady guard wagged an indulgent finger when I dared to reach over and touch an engine. The TMA-20 launch itself was striking. 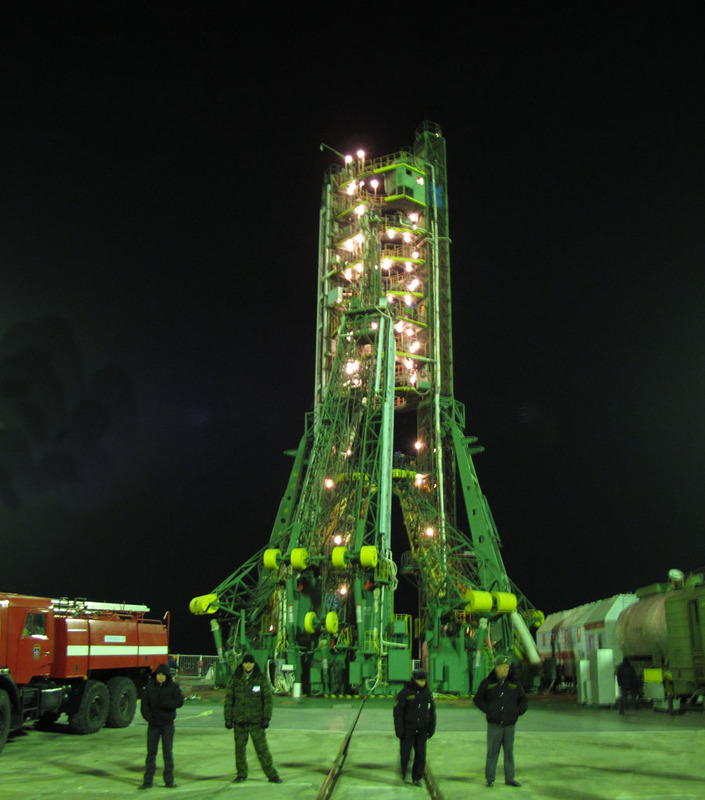 On the pad, the Soyuz sits slightly below ground level, with about half of the first stage boosters below ground. So we couldn’t directly see the initial ignition, just a sudden out-pour of smoke and spreading fire across to one side, which for a fraction of a second made me fear an accident, but no, the craft started to rise and then abruptly there was an intensely bright flame, presumably as we could now see the engines directly for the first time, a dazzling bright fireball, rising very quickly into the sky. Then a few second later a very loud rumbling sound arrived. After we first saw the engines, I never saw the craft itself – the engines were far, far too bright. It was spectacular. Much more striking than the STS-129 shuttle launch I saw, probably both because we were so much closer (0.9 miles versus 6 miles) and because this was a night launch. 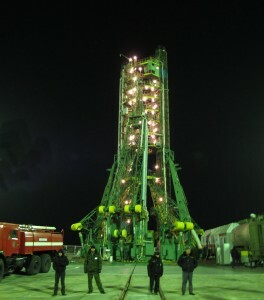 They let us visit close to the launch pad (which was the original Gagarin pad!) 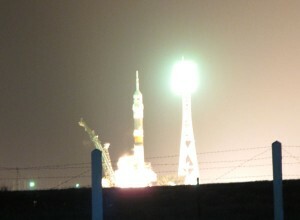 about an hour after the launch. 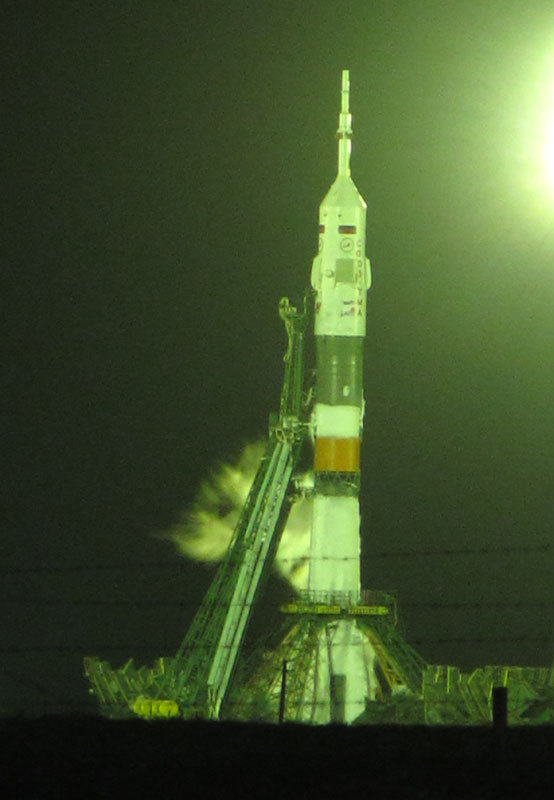 So we could see the re-assembled launch gantries and the launch pad itself up close. But they wouldn’t let us into the flame pit, so we couldn’t actually feel the residual launch heat. Drat. 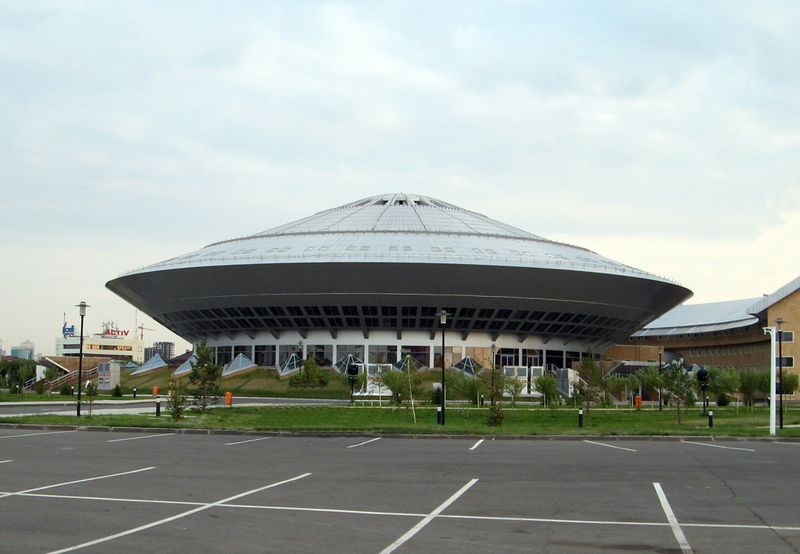 If you are a space buff, I highly recommend this tour. I’ve posted a page on Baikonur Logistics to provide more information on entry formalities, flights, tour companies, etc. 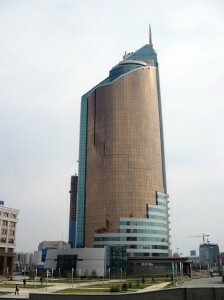 Astana is Kazakhstan’s new post-Soviet capital, in the Northern steppes. The faces on the streets seem mostly Central Asian, so it seems to have succeeded in attracting a large ethnic Kazakh population into what was formerly an ethnic-Russian part of the country. 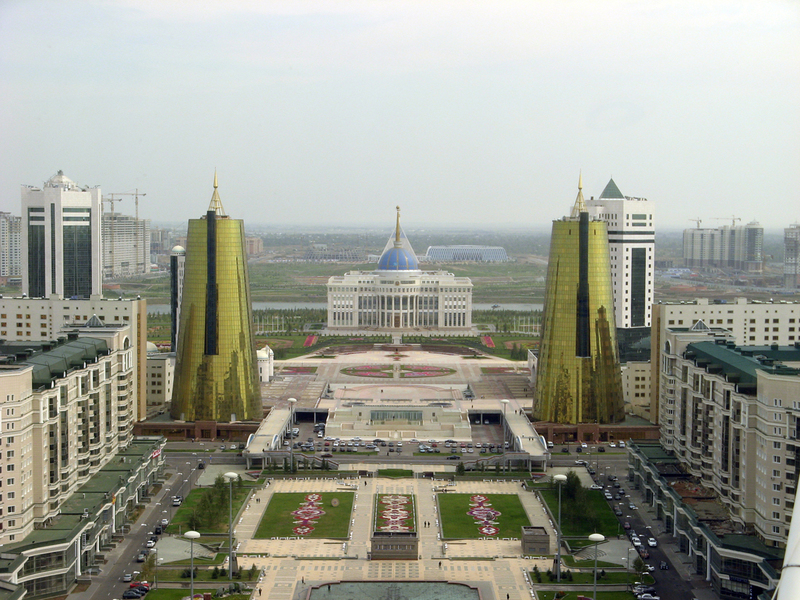 That may not have been President Nazarbayev’s sole goal, but it has certainly helped to cement a Kazakh identity in the North. 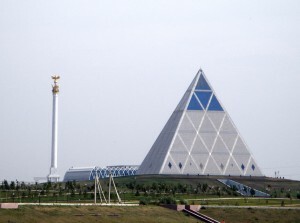 I hiked around the large, dazzling, new government area. This is like a Pudong on the Steppes, struggling on a smaller scale to represent a bold new City of the Future. I love it. While the buildings are individually smaller than the giants of Dubai or Pudong, the overall architectural style is even more aggressive, bold and dashing. And yes, genuinely futuristic. 105 meters tall and purely for fun. 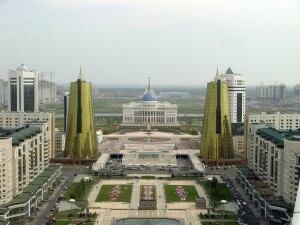 A rather bland Presidential Palace, which is ably defended by two giant Golden Daleks, and backed up by a giant pyramid. Nominally intended for meetings of world religious leaders, it doubles as a conference center and has a large concert hall in the basement. 32 stories tall. Locally nicknamed the “Cigarette Lighter”. 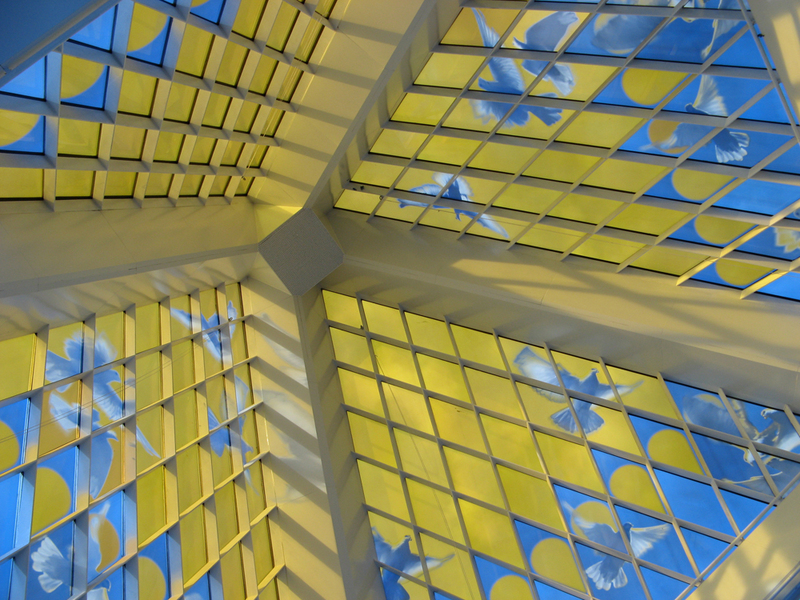 Inside the Peace pyramid, looking up at the apex. A flying saucer, unconvincingly pretending to be a circus. 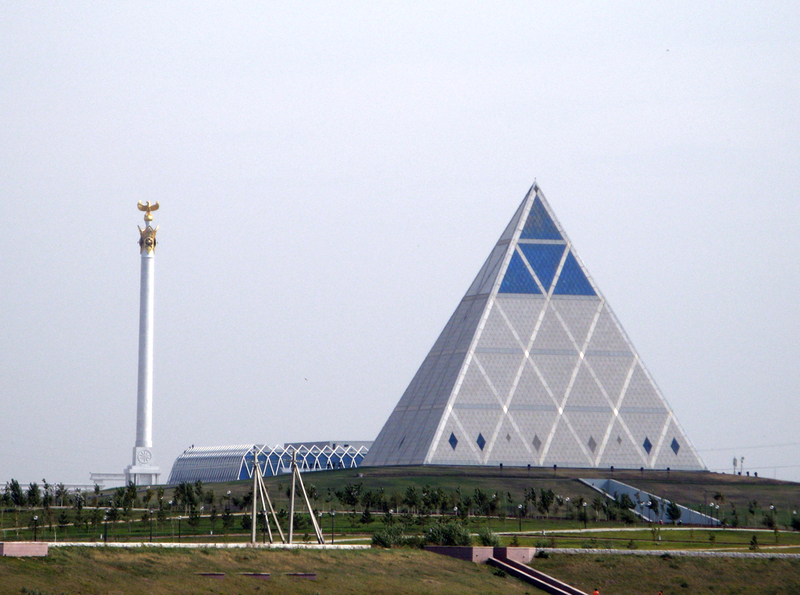 With only a few exceptions, the former Soviet Republics inherited a mix of either very bland 1930s style official buildings or mostly very dull “modern” concrete boxes. So it’s good to see an outbreak of genuinely creative architecture. I do wonder how well some of these buildings, with their bright metallic sheathings, will age. They look like they will require significant maintenance, which is often harder to find money for than the first brash conception. But all the same, I’m happy to see them! Hurrah!